Perfect for the kick drum, the supercardioid Beta 52A derives its low-end punch and sonic presence from a carefully tailored frequency response. Equipped with its own pneumatic shock mount, the Beta 52A is designed with an integral locking stand mount for quick-and-easy set up. Shure's A56D universal drum mounting system can be used to position microphones virtually anywhere - on drum rims, microphone stands, even cymbal stands. 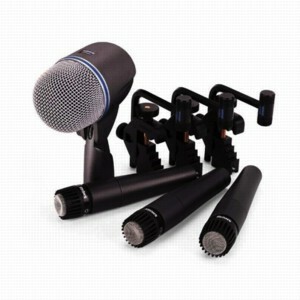 Designed with captive parts to prevent the loss of individual pieces, the A56D is small, secure, and can be used with any standard microphone, making it a great tool for both stage and studio environments. "The Beta 52 presents a punchy, hi fi sound that is always right on the money - very predictable. Dave Weckl "I always depend on the warm and true sound of Shure Microphones for my drum kit."